CONCLUSIONS: Current literature shows the JPSE to be a relevant measure when it is used correctly. All studies which calculated the JPSE over at least six trials showed a significantly increased JPSE in the neck pain group. This strongly suggests that ‘number of repetitions’ is a major element in correctly performing the JPSE test. The primary measure to clinically operationalize cervical proprioception is the Joint Position Sense Error (JPSE) (Armstrong et al., 2008; Strimpakos, 2011). Joint position sense, an individual’s ability to reproduce and perceive previous predetermined positions or ranges of motion of a joint, is amajor component of proprioception. The error people make whilst reproducing the predefined position is defined as the JPSE. Recently, several studies on the relation between neck pain and JPSE have been published (Woodhouse and Vasseljen, 2008; Cheng et al., 2010; Chen and Treleaven, 2013). Cervical proprioception is the sense of position of the head or neck in space, describing the complex interaction between afferent and efferent receptors to monitor the position and movement (Newcomer et al., 2000). In the cervical spine, this sense has its neurological basis in muscle spindles (Proske and Gandevia, 2012) and, to a lesser extent, in tendon organs (Golgi receptors) (Hogervorst and Brand, 1998), cutaneous receptors, and joint receptors (McCloskey, 1978; Grigg, 1994; Lephart et al., 1997; Proske et al., 2000). The cervical muscles provide information to (Bolton et al., 1998) and receive information from the central nervous system (Kalaska, 1994; Hellstrom et al., 2005). Afferent information from the cervical muscles converges in the vestibular nuclei, where the head movement-related information from the visual and vestibular system also converges (Corneil et al., 2002). Malmstrom et al. (2009) showed that accurate head-on-trunk orientation can be achieved without vestibular information. This suggests that proprioceptive information of the cervical spine is important for head-on-trunk orientation. 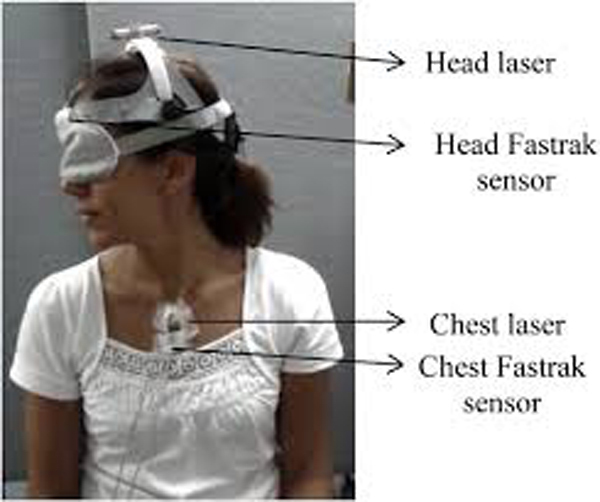 The cervical JPSE is assessed by testing the ability of a blindfolded participant to accurately relocate their head to the trunk relative to a predefined target (often the neutral position of the head) after a cervical movement. Other examples of joint regions in which JPSE has been used for testing proprioception are the shoulder (Anderson and Wee, 2011), the knee (van der Esch et al., 2013), and the ankle (Nakasa et al., 2008). People with neck pain originating from trauma and people whose neck pain has developed more gradually both seem to have a higher JPSE than people without neck pain (Feipel et al., 2006; Cheng et al., 2010). This implies that an increase in JPSE may not be caused solely by soft tissue damage or neurological impairments following trauma (Revel et al., 1991; Sterling et al., 2003). Narrative reviews of the literature on cervical JPSE have been published (Armstrong et al., 2008, Strimpakos, 2011). Both reviews give conflicting conclusions concerning the presence of a higher JPSE in people with neck pain. The present study is a comprehensive, systematic overview according the PRISMA guidelines of the literature. It presents the data of the JPSE of the cervical spine caused by neck pain of traumatic and non-traumatic origin in comparison of the JPSE in healthy controls.